Former cricketer and leading Pakistani politician Imran Khan has been injured after falling off a makeshift lift that was taking him onto a stage at an election rally in Lahore. It is unclear how badly Imran Khan was hurt, but he suffered visible head injuries in the fall. Imran Khan was taken to hospital for treatment by supporters afterwards. 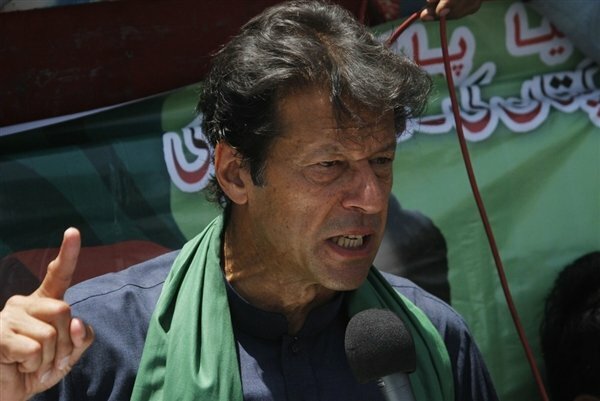 He had been campaigning ahead of Saturday’s parliamentary elections, in which his Pakistan Tehreek-e-Insaf (PTI) party is expected to do well. Dramatic television pictures from Tuesday’s campaign rally showed Imran Khan falling about 15ft from the lift platform together with several others, some of whom appeared to land on top of him. A dazed and bloodied Imran Khan was later seen being carried away by supporters to a vehicle which drove him to a local hospital. A local PTI spokesman, Malik Ishtiaq, told the AFP news agency that Imran Khan had suffered head injuries. But another spokesman described his injuries as minor and insisted he would return to the rally. “Imran Khan is all right. He has been taken to the hospital for first aid. He will be back to address the rally very soon after getting initial treatment,” Chaudhry Rizwan said. Imran Khan’s former wife Jemima Khan wrote on Twitter: “He is in hospital and conscious now”. His nephew, Hassan Niazi, tweeted: “Chairman reciting kalima in ambulance – he is fine – plz just pray”. Hundreds of well-wishers and supporters later gathered outside the Shaukat Khanum hospital, chanting “Long live Imran Khan”, AFP said. The PTI leader has been campaigning relentlessly in the run-up to Saturday’s poll and briefly collapsed on stage earlier this week. Imran Khan is one of the key candidates in the election, and the PTI has been gaining momentum. He believes a “tsunami” of support will sweep him to power.